I'm pretty sure I speak for most brides when I say that the wedding day can feel like a great big step off a very high cliff. After months of planning and stressing to make sure you get everything exactly right, when the big day comes all yo you can do is close your eyes and leap - figuratively at least. In some ways it is a huge plunge into the unknown. I have to say I took a very conventional approach to the big day. Church wedding with my Dad walking me down the aisle, three bridesmaids and a bouquet with purple irises and lilies. The organ and trumpets blared as we left the church to the sounds of Trumpet Voluntary. All very nice. All very conventional, just how I wanted it. Just right will be different for every couple. 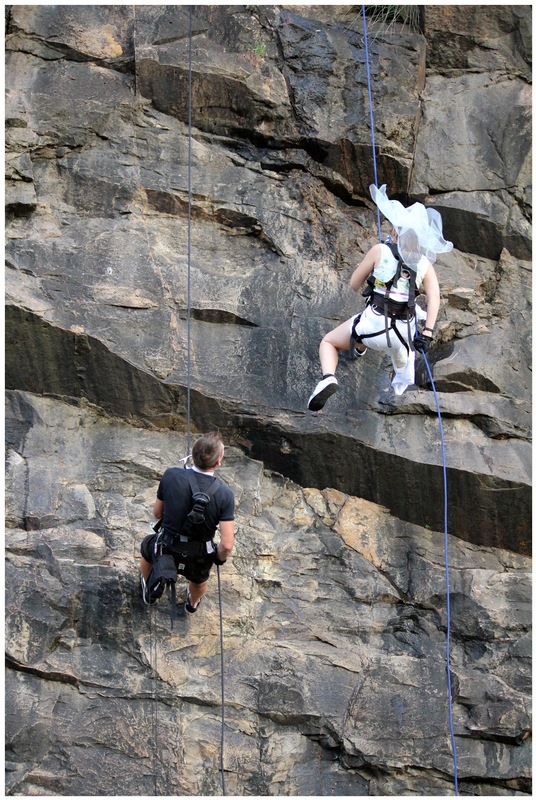 Today Stef and Simmo took taking the plunge very literally throwing themselves off the Kangaroo Point Cliffs on harnesses. 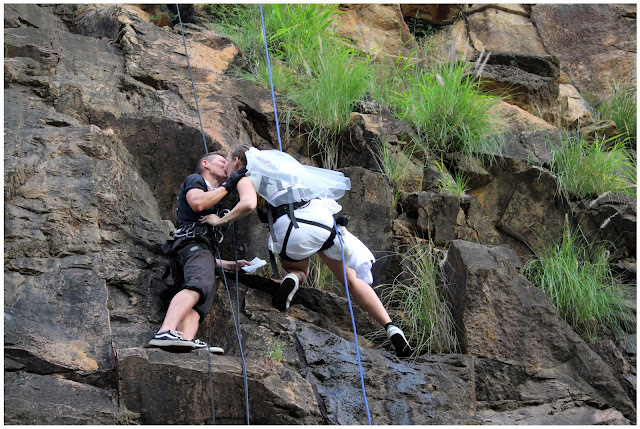 They stopped half way down and with a crowd waiting at the base of the cliff recited their vows before kissing and descending the rest of the way. The groom cried, the bride beamed and the crowd cheered. It's what the couple, who met abseiling exactly four years ago today, wanted and it was what they got. "Since being with you, my eyes have never strayed. They never will," Stef said. "You have the ability to motivate me without nagging. You've made me write lists for God's sake. You're my 3.14, you're my salty buttery goodness, you're my one and only and I love you." In reply, Simone said. "As we hang here today I want to tell you the top five reasons why I love you. 5) for still letting me eat peanuts regardless of your anaphylaxis. So for these reasons and many more I vow to keep you as my one and only lover. To be together until we are old saggy and senile, until we are unable to recognise each other but still fall in love every morning at the nursing home breakfast table eating our bowls of Coco Pops. I love you so much and can't wait to start a family and have lots of little chicken dancing babies together." 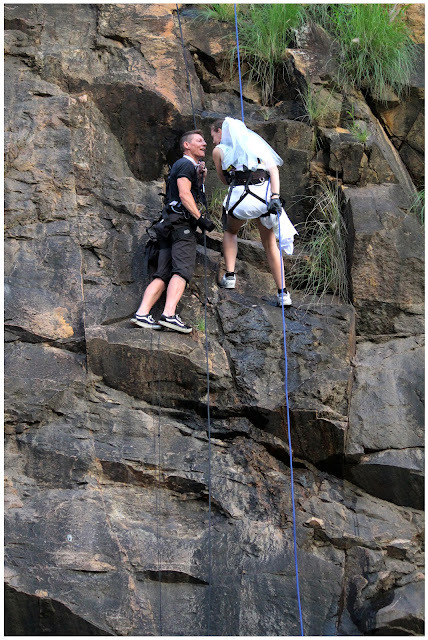 I don't know what I expected to see when walking by the Kangaroo Point Cliffs today but I can tell you this isn't it. Awwww love the vows! 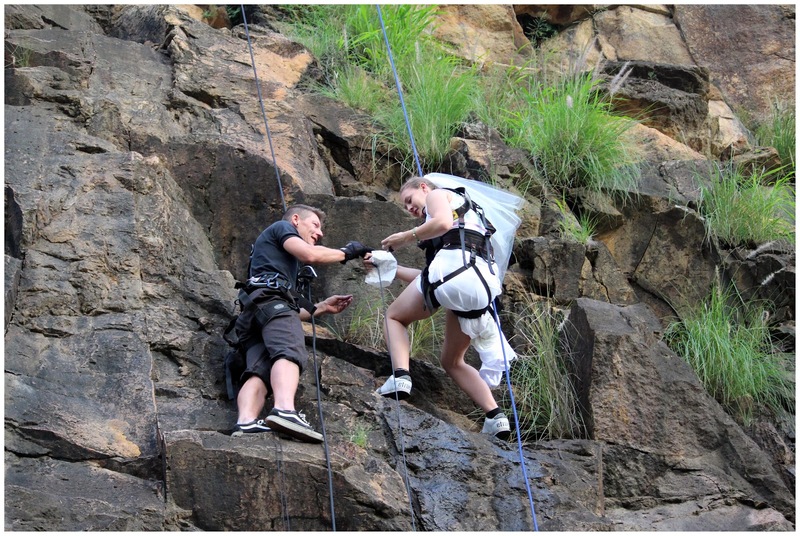 What an amazing way to get married! Amazing! Sounds like they will be very happy together. Well, that's original. Good job it wasn't raining, or snowing as now. Brrrr. How fantastic, great idea and the vows are fab. love the trainer with the wedding dress....a bit different thats for sure. Why if somebody you love has a peanut allergy would you want to risk eating them? What an amazing way to get married and the simple straight forward but utterly romantic vows are just pure perfect! Wow. That is so amazing and so romantic. March 10. Day 69. Do you see what I see?